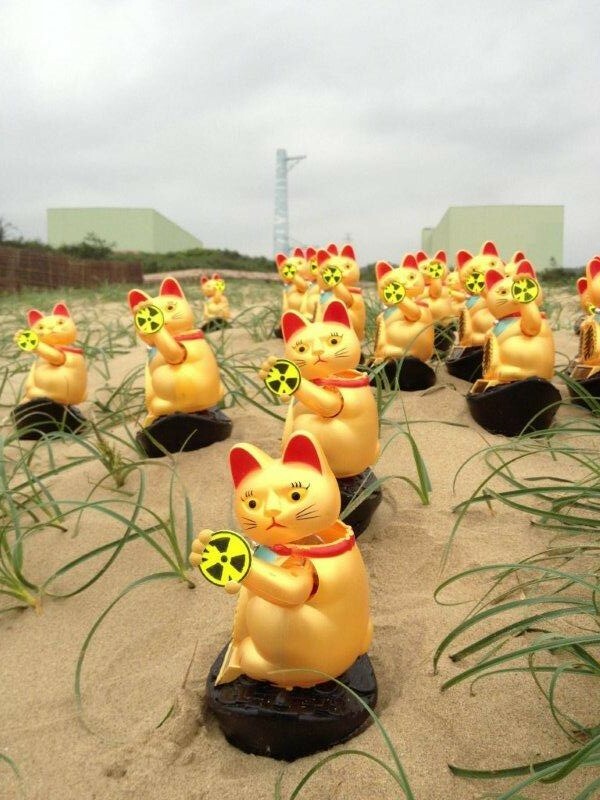 SITE UNDER PERMANENT CONSTRUCTION : NMN : modified solar powered 'Maneki Neko' Lucky Cats hold a nuke sign. A 90 degrees twist transforms the meaning of the waving gesture from 'Welcome' to 'Bye-Bye'. WE DON'T LIKE THIS CAT BUT IT WORKS !! Original photo by Bjoern Schwarz http://www.bagalute.de. 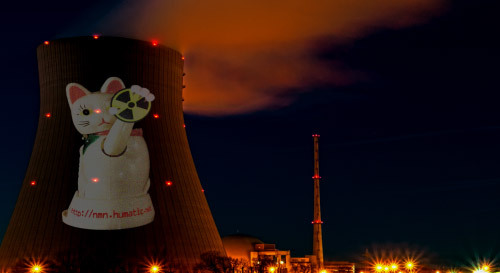 Treatment by CG NOW ACTIVISTS CAN DOWNLOAD THE NMN MOVIE LOOP TO BEAM IT ONTO THE NUCLEAR POWER PLANT IN THEIR NEIGHBORHOOD OR TO ANY OTHER BUILDING. In your PR please don't forget to mention the NMN project and Civil99, the Taiwanese anonymous activst group who had the idea in 2013. 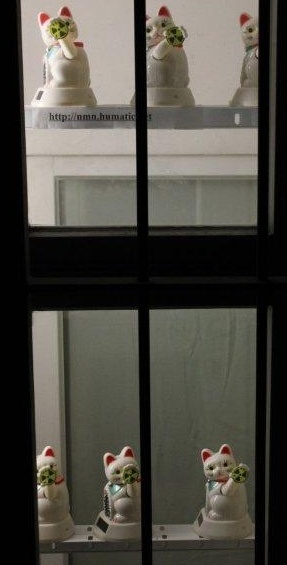 Don't forget to send photos, movies and anecdotes from your nocturnal actions. Tech :80 frames 30fps 1,4 MB full resolution quicktime h264. Feel free to convert into any other format, framerate, lenght etc to optimize your projection. 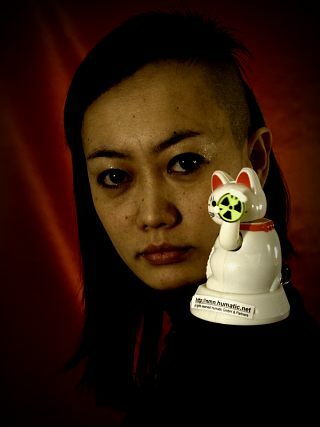 - The cat's head is turned by 90 degrees which transforms the meaning of the waving gesture from 'welcome' to 'bye-bye'. 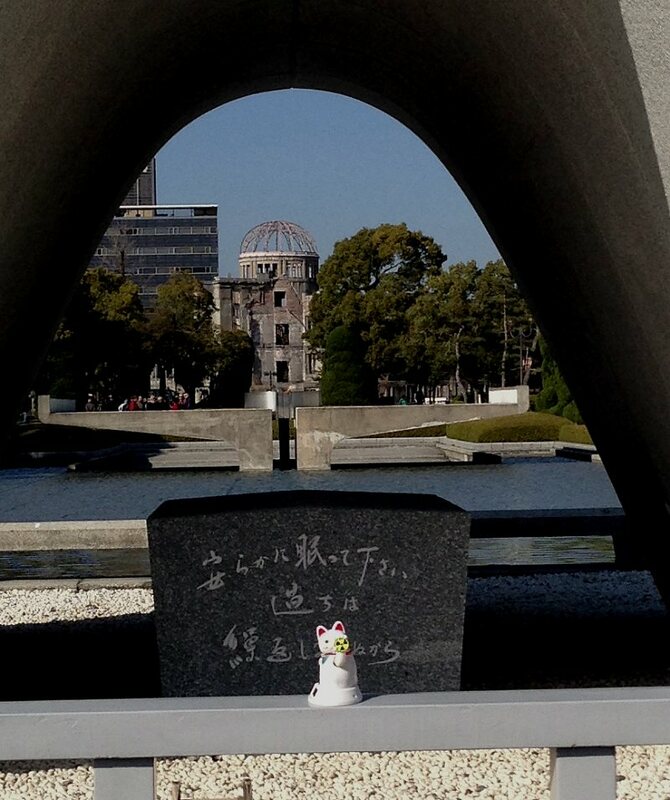 - The solar powered statue now holds a yellow-black nuke sign. 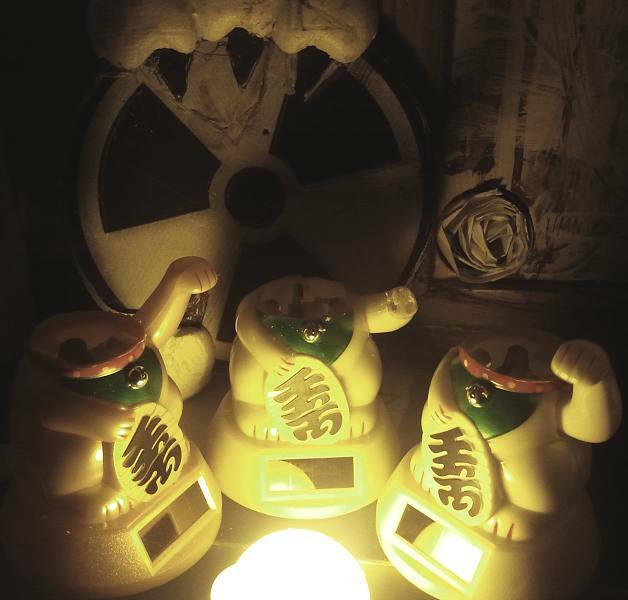 The self-explanatory objects & installations trigger a controversial discussion about touched traditions & violated values.Operating close to Kitsch & tastelessness the NMN figurine gets populized to become a new symbol for peaceful & playful protest against nuclear lunacy. The team around C. Graupner welcomes the support from the most different artists & genres and the sense of the diversity that comes with it. The many colorful partnerships are a crucial part of the NMN project which appeals to participants to contribute their own ideas & contents. (Museums) installation ( proposal ): Future NMN set ups will be planned in conjunction with the spatial & environmental possibilities: A swarm of NMN 100 ore more* cats in a museums space will be exhibited .. en-lighted by a spotlight fed -of cause- by 100% renewable power. The installation will be accompanied by documentation movies, statements, photos,etc.. a multichannel soundtrack will boost visitors involvement. *The final amount on NMN swarm members can relate on the number of NMN godparents. Additional to exhibitions in arts spaces 'guerrilla actions' continue: recently several NMNcats have been observed at popular hot spots in Hollywood, Downtown LA & Berlin Hiroshima, London and Paris, Melbourne and many other places. TRANS-PACIFIC NMN INSTALLATION On 2013 March 9-11th synchronized NMN installations took place close to the Nuclear Power Plants (NPPs) San Onofre, California,US Gongliao, Taiwan and Kashiwazaki-Kariwa, Japan. These three locations have one common ground which is the extra high risk of earthquakes. 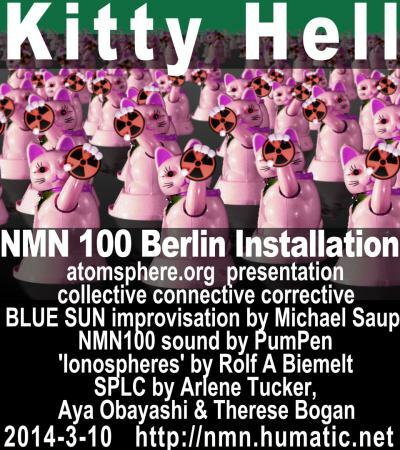 In sync with the installations there was silent NMN late night exhibition in Berlin and a colorful NMN event in Ulaanbaatar, Mongolia ...the country is in talks to become an international nuclear waste deposit and is a significant plutonium provider. 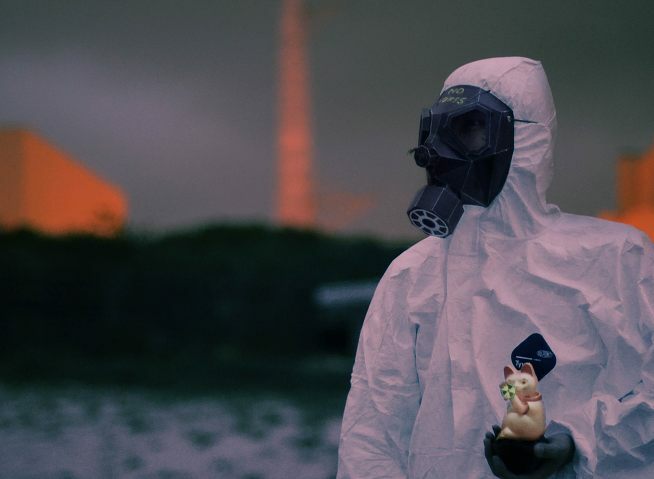 ...the NMN event depicts the boundlessness of radiation, lunacy AND resistance. Far from megalomania it is good to see the NMN signal making its way and the project getting its own dynamic. Aldraa LD coordinated the NMN Project at Ulaanbaatar . and various other European cities recently. 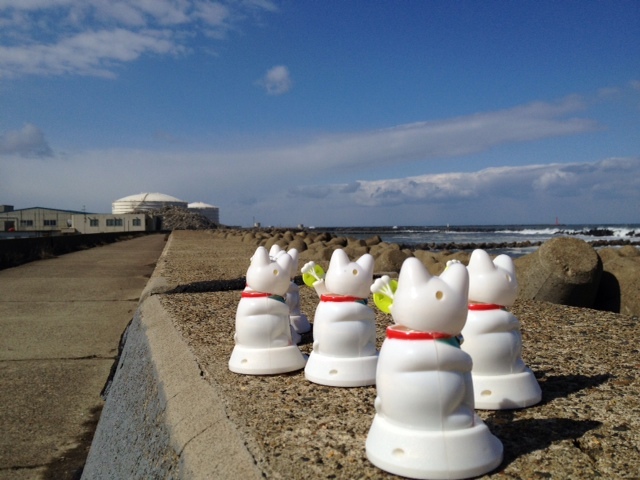 The artist Horiaki Ibe joined the action by setting up a NMN Bye-Bye Nukes installation beside Kashiwazaki-Kariwa NPP Japan's biggest one ... located at the west coast . above: NMN at Heiwa-cho,Niigata-city , Japan . below: during the night they warm their headless bodies at camp fires. If NMN ever will make any profits we will donate at least 50% to organisations fighting for independent renewable power projects or against irresponsable nuclear tech use. The rest of possible benefits will be invested in new art projects. Soon we will offer special editions of the NMN cat directly on this website and through onlone galleries as Saatchi. com . 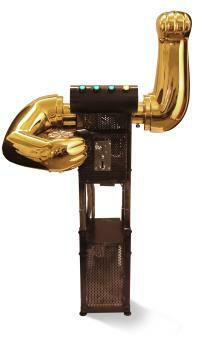 The (art) collectors edition will be limited, numbered , certificated by the artist. Taiwan : Civil 99 activist group with many anonymous members. Mongolia: Aldraa LD , Overtone singer Hoosoo Hosoo, Rapper Gee Ccb, Jonon Tsogoo, Nomuundelger Bayrsaihan, Tserenbyamba Tsend, Bulgaa Bulgan and many many more. 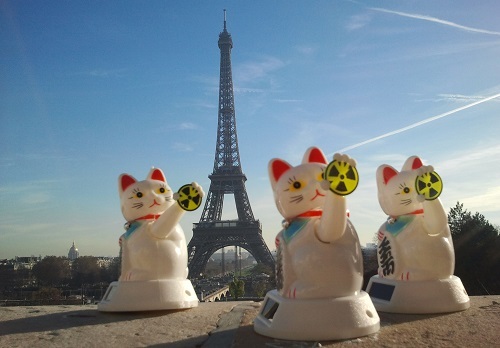 The NMN No More Nukes Bye-ByeNeko solar driven lucky cat ( in short: NMN-Cat) uses a well known symbol for 'welcome, luck and money' and transforms the message to ' bye-bye & danger ' by using a simple trick. NMN as an 'object trouvé' which has been destroyed, modified and reassembled stands for a change. 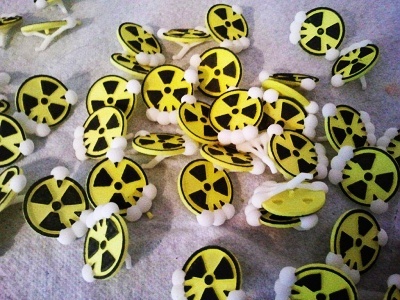 NMN says NO to nukes and YES to the sun .... with a smile! NMN sign and project is open for further association levels. NMN wants to be transparent and wants to take part in the battle against half-truth , disinformation, censorship, hectoring and corruption. Expert(s) in strategie , communication & marketing. 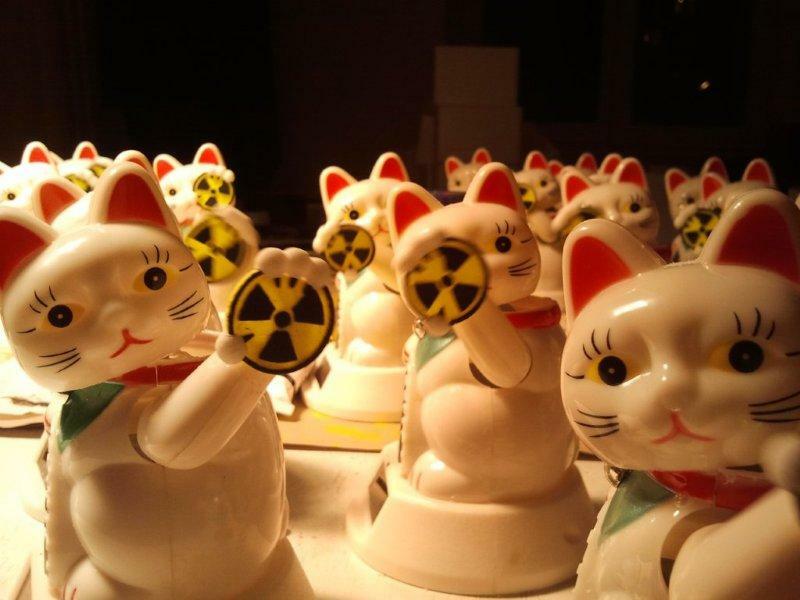 Research concerning the meaning & history of the original Maneki Neko figure leads to dozens of interpretations. 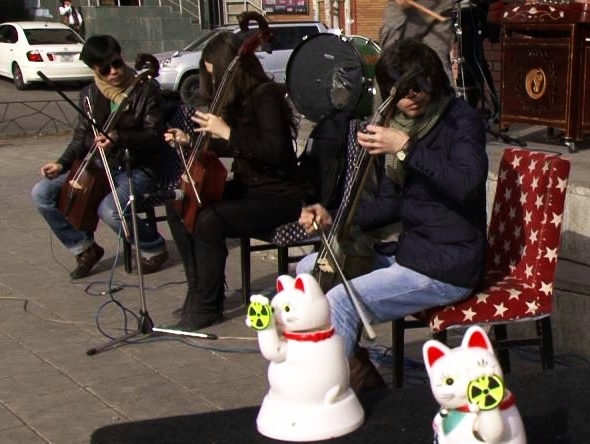 We found some interesting websites and even 'Beckoning Cat' museums. 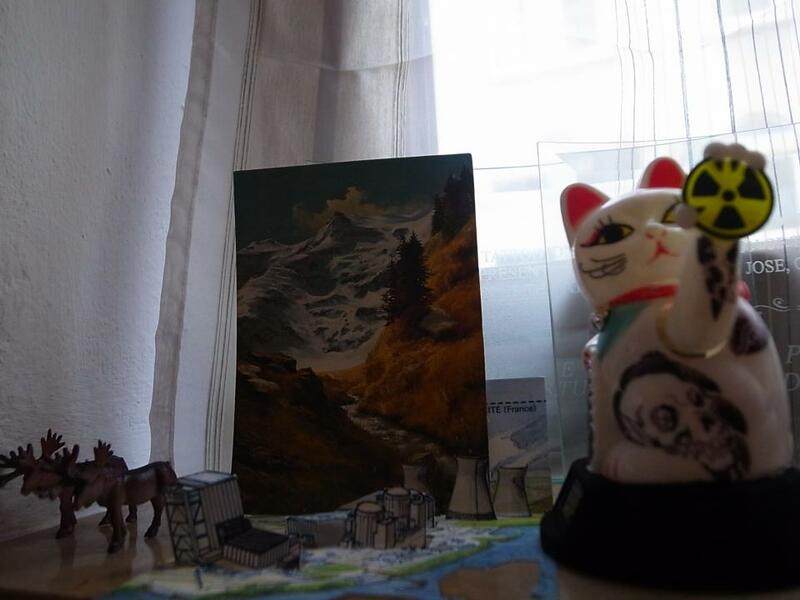 A German website Winkekatze.info collects as well bbizarre stuff , videos and art pieces around the lucky cat . The cat is very proud to be mentioned there.